Product manager Guy Snir said in a blog post that it is extending its creator revenue program to “creators of all sizes,” giving video creators that are approved by its Amplify Publisher Program the opportunity to run pre-roll ads prior to their content and collect a portion of the ad revenue. Snir did not specify terms, but a source told Kurt Wagner of Re/code that participating creators will receive 70 percent of generated revenue, compared with 55 percent for YouTube. Complete opt-in control/flexibility: Program participants can either elect to opt-in videos tweet-by-tweet or preset monetization for all of their videos. Content can be opted-in for monetization 100 percent non-exclusively, meaning that creators can elect to monetize it on Twitter as well as other platforms. Creators can now upload, manage and publish media more efficiently and effectively than ever before across both desktop (via the new Media Studio) and mobile (via the Twitter Engage application). A new unified media library (videos, GIFs, and images). Improvements in stability and upload performance. Finally, Twitter added an “Earnings” section to Twitter Engage to enable creators to track their earnings via Twitter and its Niche creator platform. 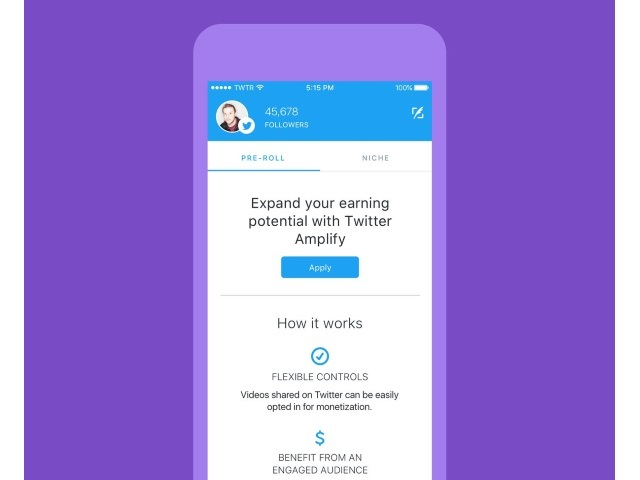 For Mobile, download the Twitter Engage app, click on the “Earnings” tab and sign-up for the Amplify Publisher Program and Niche directly within the app to see if you are eligible. The updates will be reflected in the App Store in the coming days. Readers: What are your thoughts on Twitter’s announcement?